Hey guys, my name is Robert McCall. I’m the Team Manager for Dynamic Discs, and I’ve been playing disc golf for around 10 years. I’ve played with players from all over the world, and I’ve been doing my best to learn from as many of them as possible. In the Quick Tip series, I’m going to share something I’ve learned over the years from a combination of personal experience and expertise from other players. Late in your tournament round, you and another player are jockeying for position, trading birdies and pars on your way to the last few holes. You throw a fantastic drive on hole 17, landing around 20 feet away from the basket. Your opponent throws a decent drive but lands 60 feet out. You think to yourself, “I’ve got another one. I’ll be up 1 going to 18.” As you approach your lie, you begin counting all of the dollars (#discgolfrich) you’ll get or all of the discs you’ll be able to choose from for winning this tournament. Then, in uncanny fashion, your opponent jams their 60 footer. You incredulously walk to your shot, look up to the basket, and all of a sudden, your routine 20 footer feels like a 40 footer with a lot more pressure than you had anticipated. I’m no expert, but I believe the scientific term for this phenomenon is getting “big-putted”, or alternately, “playing any round of disc golf with Ricky Wysocki”. I’m unsure of which is more correct. Either way, unless your mental game is perfectly steady, watching a long putt go in can cause you to feel more nervous about your putt. At a recent tournament, I had some extra time to warm-up because of how the tee times were set up, so I was just putting to stay warm. While I was putting, Spencer Ling from Nevada asked me if I wanted to have a putting duel. I didn’t know what a putting duel was, but I agreed. He paced off 30 feet or so and set down a marker for us, and then he explained the premise of the game: we trade putts one by one. If he makes and I miss or vice versa, the person that made the putt gets a point. If we both make it or both miss it, no points are awarded. If Spencer makes a putt and I miss, he goes first again. However, if he misses and I make it, I get a point and take the box, putting first for the next putt. We played to 10 points. At first, I was just having fun putting, because I really enjoy putting, but after a few makes and misses, we both became slightly more competitive and focused, because even if nothing is on the line, no one likes to lose. Though we weren’t playing a competitive round, this format allowed us to feel some pressure on our putts, and by the time the round was about to begin, both of us had our putting stroke grooved in fairly well. I don’t think it’s a coincidence that I putted well during the round that followed because we’d both had an opportunity to feel some nerves while putting before throwing putts that actually counted toward tournament scores. I will definitely try some more putting duels before tournament rounds, but also during putting practice sessions to mix it up a bit. Thanks so much (and full credit goes to) Spencer Ling for sharing the game he created with me! I’d love to hear what kind of competitive putting games you’ve created or tried! 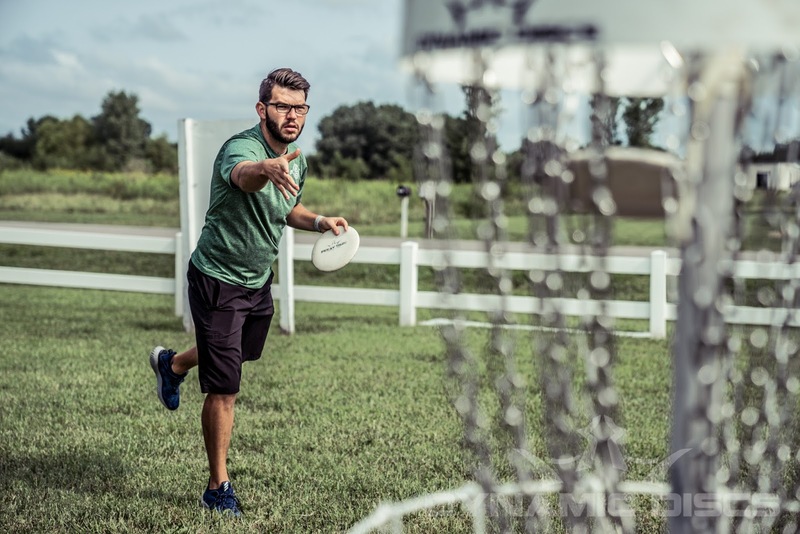 If you have some suggestions that work well for you, I’d really appreciate if you submit a question to the Disc Golf Answer Man podcast, call into Disc Golf Answer Man on the Anchor app, or post in the Disc Golf Answer Man Facebook page. You can also reach me via my social media links below. See you next week! Follow Robert McCall on Facebook and Instagarm. Nice! I like that idea - will have to try it out sometime. Me and my cousins did putting league style with two baskets 30' from each other. Some people play it a little different, but we played with two people per team each having one putter. If one team gets one putt in, they get one point. If both go in, they get three. First to 11 wins, and in case of ties, we keep going until someone wins. Absolutely - I like the competitive aspect of games like these, and I like that you get a bonus for making two putts. It makes every putt count! A friend and I developed a game we just call 'Points', based on 1 point for chains, 3 points for a make. We'd take 3 discs each, flip for start, choose a spot and putt. Top score of the frame takes the box and can choose a new spot. Usually play to 21. To mix it up we'd charge a negative 1 for striking declared obstacles. I've played this one as well! I'd say the only downside I could see is that you'd often practice "circus" type HORSE shots. Don't get me wrong - I love playing HORSE and trying crazy stuff, but leading up to a tournament round, I really liked seeing putts that I would likely see during the round. I came out on top of this putting duel, but I'm looking forward to more in the future!